Since I am currently on my summer break I thought it would be interesting to share what items I keep in my work bag. I don't work in a glamorous area so I make sure that all the contents in my bag aren't that valuable to me. So most of the items in my purse are worn out and missing lettering. All the items are stored in a black studded tote bag that I got for a really amazing price at the Fred Flare closing store sale. I've had this for a really long time but never used it before so I now use it as my work bag. Inside my bag I store a few water bottles and snack to munch on during the day. 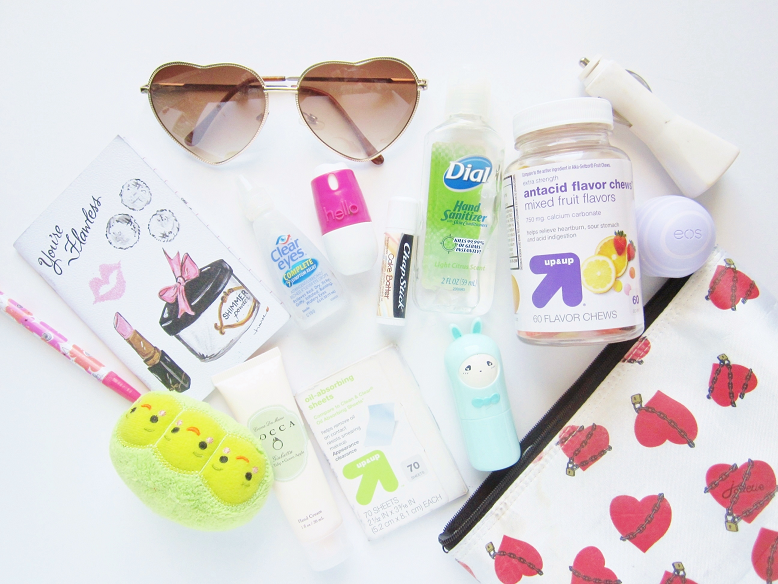 For all my smaller items I keep them in a small makeup pouch that I received in a Zipper Magazine. Pretty much everything fits perfectly inside (as long as I don't zip it up). I keep a notebook and pencil in my bag at all time for any blog post or project ideas that may come to my mind. You never know when creativity will struck! This is my favorite hand cream that I received in a previous Birchbox. It's very hydrating and makes my hands feel refreshed and moisturized. My face use to be really oily however I face isn't as oily as it use to be. But I still like to keep these oily-absorbing sheets just in case. I simply blot away any shiny spots and they magically vanish! All year long I suffer with itchy watery eyes. It's a pain in the but, especially on days when I want to practice my eyeliner! So I always keep some sort of eye drops in my bag. This is one of my many pairs of heart shades that I owe. They're the beat up pair. You can't really tell though in the photos! But there is scratches all over them! This is a breath mist that I also received in a past Birchbox. I don't know why or how this was in my bag.But I don't have anywhere to keep it so it lives in my work bag. My favorite Chapstick! I love the scent and how moisturized my lips feel afterwards! An essential! I must always keep a hand sanitizer in my bag! To keep me smelly fresh I use this perfumed bar from Tony Moly. It's in the shape of a cute bunny so it adds some cuteness to the inside of my purse. I bought these antacid chews for instant heartburn relief. I don't use them as much as I use to because my heartburn isn't as bad anymore. I still like to keep with me in case I get a bad heartburn attack. Another must have! I can't have my phone's battery lower then 30%. Another lip balm because you can't have just one! Sometimes I even carry three! Do you keep a work bag?